Guernsey’s new airport upgrade project is set to be completed by end of October 2013. The redevelopment was originally planned to take 22 months, but is set to be completed two months ahead of schedule. The work, which began in March 2012, includes removal of an dip in the runway. There is also a 120 metre runway extension to the west. This means the operational length of the runway is 1,463 metres, but the airport says the extension provides longer safety areas at both ends of the runway. The existing taxiway had to be extended to link the western end with the rest of the airfield, and complete reconstruction of the airport’s apron area and the terminal. They have also moved the approach lights, installing new ground lighting and navigational aids and relaying all surfaces. Guernsey airport has about 800 – 900,000 passengers per year, making it a bit less busy than Cardiff or Prestwick. Guernsey’s new €93 million Airport 2040 upgrade project is set to be completed by end of October 2013. The redevelopment was originally planned to take 22 months, but is set to be completed two months ahead of schedule. Work was started in March 2012 and has included the removal of an historic dip in the runway. It has also seen construction of an additional 120 metre runway section and complete reconstruction of the airport’s apron area. Design and engineering specialist TPS, has managed the rehabilitation and improvement of runway, taxiways and aircraft aprons at the airport. Project manager Gerry Prickett, says: “The new section of runway added at the western end of the site moves the airstrip 120 metres to the west, while the existing taxiway also had to be extended to link the western end with the rest of the airfield. The airport’s terminal was built in 2004 and the old apron, which dated back to the 1960s has been completely rebuilt. Work has been carried out in six phases so normal operations at Guernsey Airport could continue, with two of these phases providing additional aircraft stands on what were grass areas. The final major phase this summer involved the bussing of passengers to and from these areas while a large part of the existing concrete has been rebuilt to higher strength. 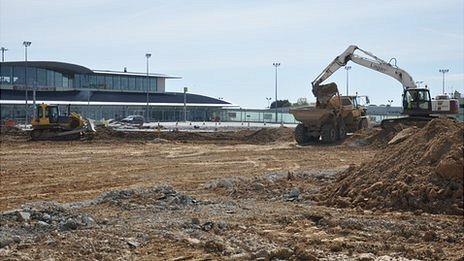 Work to upgrade Guernsey’s airfield could be completed by October, if the dry weather continues, the manager of the £80m project has said. Gerry Prickett said he was “delighted” by the progress of the work. He said after delays caused by wet weather last year it would “certainly be finished by the end of the year”. Mr Prickett said once work on the airfield was complete the building compounds supporting the work would be returned to their original state. This includes the sites housing a concrete batching plant opposite the airport entrance and the material store at Longue Hougue, where a temporary dock has already been removed. The project, which started in February 2012, aims to prepare the airfield to last until 2040. It includes repositioning the runway by 120m (394ft) to the west, moving the approach lights, installing new ground lighting and navigational aids and relaying all surfaces. Longer grass safety areas are being created at both end of the runway and a new drainage system is being installed. The apron, where planes stop to disembark and take on board passengers and cargo, is being re-laid in stages and currently it is the area right next to the terminal building that is being worked on. Airport director Colin Le Ray said: “This phase on the apron was always recognised as the most challenging. “The fact that the weather is glorious and has been really since Easter has really helped the contractor to get ahead to make up some of that time we lost last summer. Buses have been leased to ferry people to and from planes while the area next to the airport terminal is out of use. Mr Le Ray said by levelling out the area it would save on the amount of concrete that is needed. Lagan Construction is delighted to have signed a £80 million contract, part of the Guernsey Airport Redevelopment Project. Planning approval for the work at the airport was granted in October 2011. The works predominately include the rehabilitation and reconstruction of the existing airfield pavements including the runway, apron and taxiways and the installation of a new surface water drainage system. Works are due to commence in January 2012 and will take approximately 2 years to complete. Posted: Tuesday, October 29th, 2013. Filed in News about Airports, Recent News.